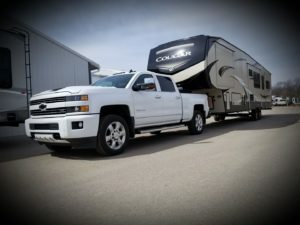 It would appear that we are marching into that time of year when daylight is less, temps are low and that other form of precipitation starts to accumulate on everything including your camper. I for one, am going to use this season to get organized. After our final camping trip to Sault Ste. Marie, Michigan we needed to empty Randi out completely because she was headed to the factory for a semi face lift, we had a delamination issue that needed taken care of. We miss her very much and look forward to bringing her back home. Upon hauling everything into our home, I soon realized we had so many things that we never used over the course of camping season. I would imagine that if we were full timers this may be different and we will evaluate that when we embark on that journey. I spent the better part of 2 days sorting through things, repacking and organizing our totes. 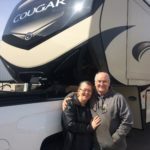 We had decided at the beginning of our camping season and the first time ever owning a fifth wheel, that everything we purchased to go into it would be the color purple if at all possible. Not just any purple, a deeper more rich color purple so as not to be overwhelmed with intense shades. With that mindset we wanted to find purple dishes, after searching stores and online we found some, unfortunately they are stoneware, very heavy and break very easily, they got us through this summer but we have decided they will not be going back in next year, our search carries on for something a bit lighter and closer to non breakable. I could ramble on about my organization skills but I shall not, I am sure we are not the only ones anxious to get thru this season and look forward to all the wonderful adventures that await next spring, we are headed to Hershey, PA in May and can not wait!! !